Hi Jamie! So what exactly is a 'Hellscreen'? The Hellscreen is an ancient machine created by the gods millennia ago to determine objectively who should go to the afterlife and who should go to Hell. It exists in its own dimension, outside of space and time and is a vast evolving, biomechanical machine. It consumes the natural resources of its surrounding environment and slowly expands across the entire planet it inhabits like a plaque. Sounds awesome, so how did the project start? The project initially started as a way to learn new plugins for unity called 'playmaker'. It allowed me to use a node-based scripting language to prototype some FPS mechanics and create a little playable inspired by devil daggers, but with a Game Boy palette. After I got the basics in, I started revisiting an old idea for an FPS which I had in my head for about 15 years - Doom but with a heavy emphasis on Giger-inspired architecture. Taking that seed and mixing it with more recent ideas for mechanics and until it began resembling what you see today. Since then, I added more idle clicker style elements, the rear-view mirror and transforming weapons. Your body of work is split between being similar in tone to Hellscreen, and then... not at all! Did your roles differ much from project to project? The roles only really changed in terms of responsibility from project to project. Generally, throughout my jobs have involved creating environments and props. The last few projects tended to have me wearing a few hats and looking more at technical ways to achieve features and effects and performing a more senior role. More recently I have been freelancing and has seen me return to a small environment/props based role. Has any of your other work influenced Hellscreen in any way? A lot of my work has been so stylised and kid-friendly that that side of my experience hasn't really influenced Hellscreen much. Killzone Mercenary kept reminding me that I wanted to develop the old idea of Hellscreen at the time but no direct influence was really there. I'd say I was more inspired by other games - Devil Daggers inspired me in terms of scope but the main influences are Alien Trilogy, Jedi Knight, Classic Doom, DOOM 2016 and more recently Dusk. I play as many indie FPS as I can to see how they compare. Hellscreen is a retro-inspired game in 2018 - is that difficult to balance in terms of consumer expectation? I think its always difficult to convey the idea of the game effectively. This has been especially apparent in the Kickstarter where I could have had more emphasis on the unique gameplay features in the game. People tend to judge very quickly too (who can blame them with so much new information being released every minute!) so trying to convey that it isn't just a devil daggers clone is an ongoing issue. On the flipside, the '90s FPS revival also makes it easier to share and be part of a community. People don't need a lot of references to understand that it is in that genre of games. There is a heavy backstory and lore to the game- what works of popular culture influence you? The Alien movies and by extension, the works of Giger are a primary influence on the art style which in turn informed the story. I actually started with the art style and design and worked the story into that. Arthur C Clarke's writings are a huge influence on the world building too, especially with some of the grander ideas that are present in his books. Old pixel art from some Amiga games as well as a particular stage from Streets Of Rage II are always present in my mind too. How is the aesthetic integral to the experience? The aesthetic is designed to stand out from other games initially but also has a gameplay language. The redder colours stand out and draw the eye to dangerous elements allowing the player to focus on the second to second gameplay and be aware of all hazards. The rear-view mirror plays a part in the aesthetic too, with the mirror allowing for different view modes (i.e the Hellscreen version of night vision, invisible enemy detection etc). What kind of locations can we expect and do they influence the gameplay? The game takes place in the Hellscreen dimension and will explore the history of its growth and evolution. Existing outside of time, the machine looks to human history to its continued, ongoing design. What was the Hellscreen like during medieval times? What was it like in the primordial era? What was the planet like before the machine was created? Is it alive? These questions will be answered throughout the game. There are five planned locations, each with the Hellscreen twist. These areas will have their own traps and mechanics and will allow for lots of interesting encounters and will feel different to each other. As a fan of the genre, what elements are a priority for you when developing the game? Recreating that feeling of playing a fast-paced FPS is the number one goal, but also adding new twists to refresh the genre. The weapons have to feel chunky and the levels must be interesting to navigate. The enemies should feel dangerous but the player should also feel powerful. As a games artist, It is important it has its own identity and try to do new things with the genre to give it its own flavour and feel different to anything that you have played before. You've announced only PC, but Switch is definitely on your radar? Nintendo Switch is my ultimate goal. Hellscreen looks great on small screens and the Joy-Cons even look similar to the colour palette in the game. It's ultimately up to Nintendo though! I think it would be seriously cool to play on the go. Well it's certainly got its own unique visual style. Now this is my kinda FPS. I loved playing the 90s ones over what's "popular" now. They are always just more fun and feel like actual games. The artstyle does achieve the "uncomfortable" part, especially with that weird palette. Was interested at the start of the article, but I don't like the fact that your gun gets somewhat lost against the background. I'm not going to comment on the gameplay because I have no idea how that is, but this does not work for me visually. It looks like exactly what it is (as far as I can tell): An okay-ish-looking 3D fps game with a pretty fugly graphics filter/shader applied to try and make it look "retro" in a kinda artistically clumsy way. Sorry to be down on an indie project just trying to get a break--trust me, I know firsthand how hard that is--but I don't personally think that's the right way to do the whole retro look/style justice. I wish the game actually looked like a proper '90s fps like Doom, Duke Nukem 3D, Quake, GoldenEye 007, Half-Life and Counter-Strike (1.5/1.6), etc. 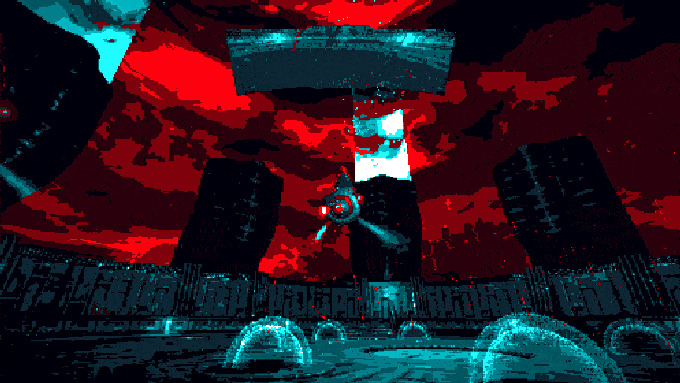 Maybe the fact you've turned the colour palette down to like 2-bit/4-bit or something is the bigger problem, so you have a sky texture, for example, that looks like it doesn't have enough colours to actually display properly (it has like only three shades of red plus is in really low-res). 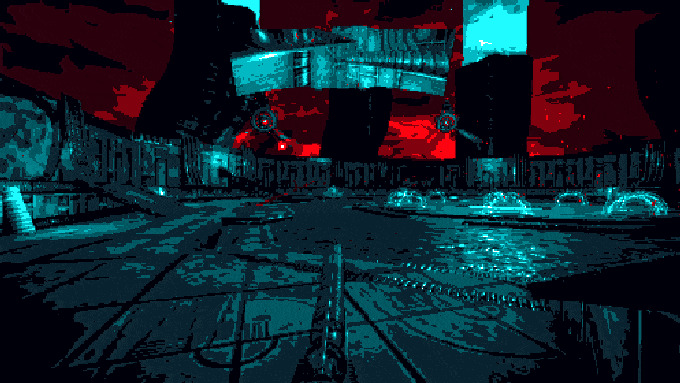 And I know Quake's skybox actually looked kinda fugly and low-colour too, at least in all versions of the game I've seen, but I wouldn't use that as an example to follow in this particular case. Sorry, but that color palette is awful. 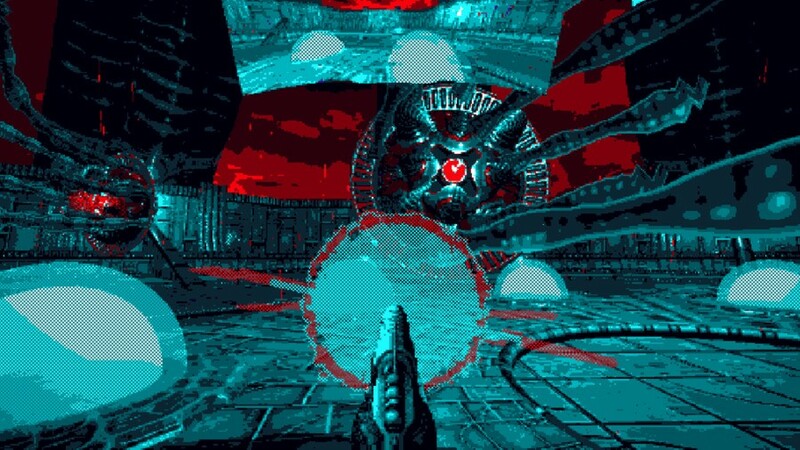 I love fast-paced FPS games from back in the day, but I also prefer 256 color in my retro games too! I hope this game does well for the developer, but it's not my cup of tea. I have all the nostalgia for many of the games I played growing up. And find certain artstyles ever green. Like the GBA Fire Emblem, Advance Wars and Pokemon games, as well as certain 8 and 16 bit titles like Mario 3, Mario World and A Link to The Past. But many games from the past just don't really look good because of the technical limitations of the era. Early FPS games are, in my opinion, in the group of retro games that are just ugly. Maybe someday I will get my Nostalgia fuel with Wargroove FINALLY releases and hopefully scratches that Advance Wars itch that I have been craving for so long. @Heavyarms55 A few do actually hold up pretty well visually for me personlly (in their obviously simpler way): Titles such as Doom, Duke Nukem 3D, Quake, GoldenEye 007 (in single player), Half-Life and Counter-Strike (1.5/1.6). I can look at them playing now and still be perfectly content with what I'm seen for the most part. I mean, they all look very basic, but I think the artists did a good enough job within the graphical limitations of the time that they now just look kinda "artistic" in their own retro way. Ha, what is this?! It looks like Doom but on a broken screen. Not for me. I have fond memories of the old Doom and Quake and was interested after reading the headline but those screenshots have put me off. I'd love to be proved wrong but it doesn't look very good. I don’t know about everyone else but I always think FPS games need to look more and more realistic to feel more immersive. Depends on the art style of course. That isn't what old FPS games looked like in the slightest. It's clearly just running modern material shaders with some sort of posterisation/quantizer filter on top. It looks utterly hideous. If it was any good he wouldn't need kickstarter!!!! @dew12333 This isn't even close to being true: Shovel Knight is one of the best games in the last X years and it was a Kickstarter project through and through. @sandman89 Fluid gameplay and sound design takes precedence IMO. Especially if the game depicts clearly unreal worlds, like alien planets or hellscapes. The rear view mirror is making me feel sick. But these are some pretty slick filters. I like the visual art style but the game contents doesn't really appeal to me much. It seems like all you're shooting are just a bunch of mindless bots in the game. No demons, zombies, soldiers, creatures, bosses, etc., at all. Sounds cool. I definitely would check this out. Hopefully sooner than later. I have to echo similar comments in this thread - the art style just doesn't work for me. I don't mind retro style, pixel art, etc... but that combined with the color palate isn't doing it for me. It's also add to see such a low resolution game with such a limited color palate running at extremely high FPS. It's jarring to me. It's a unique concept, but unfortunately, uniqueness isn't always a good thing. The kickstarter says nothing about the Switch. In the interview, the person says that the switch is his "ultimate goal" but If that were true then it would be mentioned somewhere in the campaign. On top of all that there's two weeks left in the campaign and its not even 20% funded. The color palette just hurt my eyes. Btw why the weapons have the same color with the backrounds? It gave me a headache, motion sickness and nausea. Looks neat to me. We'll see how it shakes out. Looks interesting enough. With gyro-aiming this would definitely grab my attention. To me it looks like someone attempted Doom on the ZX Spectrum with the way the gun disappears into the background! i would agree but since we're so far away from 'reaslistic' i'm fine with doing it differently. sure we're getting closer but it's going to be a long time before we get to realistic. the best now still looks like mannequins running around on poorly textured soil. add in the awful foliage and silly looking vehicles and yeah.... we're a LONG way away. this isn't even mentioning physics/ai which are still gross as well. I found the videos hard to watch, I wouldn't want to attempt to play this. That colour duochromaticwhatever is really hard to look at. If it was true doom styled 2d shooter I'd get it. But as others have pointed out its just a 3d shooter with a filter on it, dissapointing. Bet this guy played a lot of Devil Daggers. The rearview thing is weird, but I'd give it a chance. I was waiting awhile for the video to finish loading. I assumed my slow internet connection was why the game looked so fugly. 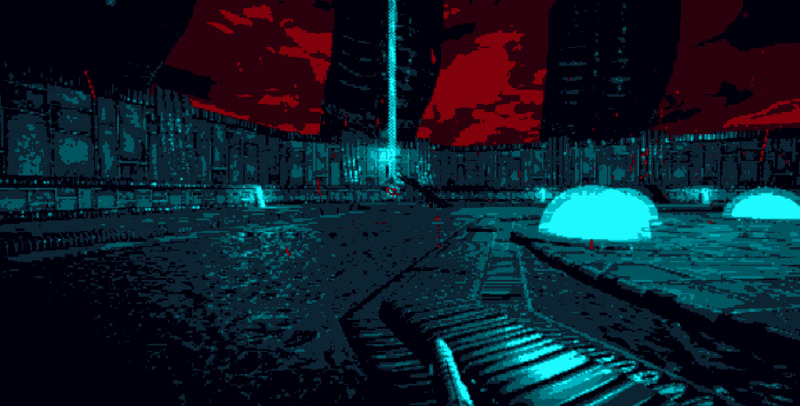 Looks like a rejected virtual boy game. It look like Marathon, the retro version. Add 4-5 colors, and we'll be talking. Well, this is right in my wheelhouse and while I appreciate the verve... I can't shake the feeling of disappointment because this could be so much more. I need to see more speedy movement, more impact, , more foreboding... It's completely missing the feeling of claustrophobic rage. Also, FPS with drone-type enemies are the worst. Nintendo I am begging, please no more retro pixel BS please!!! @impurekind I mean, they certainly aren't unplayable but they don't look good, even for their time. Doesn't mean I didn't enjoy many of them, just that it was definitely the gameplay and not the visuals that made them memorable. More FPS on Switch? Yes please. More pixelated indie games? No thanks, we’ve already got enough of them cluttering up the e-store. Looks weird. I'd rather we got a version of Duke Nukem 3d 20th anniversary world tour for the switch. I absolutely LOVE 90’s FPS games. Exhumed, Duke 3D, Shadow Warrior and Blood to mention a few. Oh, and the original DOOM is one of my favourite games ever. This game, however, does not look anything like any of those games. This looks like a really bad game, and also ugly as hell. What’s with the weird colour palette? It all comes down to how those simpler visuals are done for me, and I personally think the other examples I mentioned earlier hold up similarly for the most part (not in every area but enough to still be appreciated even today, in a retro way). Note: Some of the footage is in higher resolution than the original games would have run and/or emulated but it's actually closer to how the game looked on my TV back in the day than any of the really low-res and low quality YouTube footage I can find that's supposed to be how those games originally looked--I feel bad for anyone who played those games when they originally came out and they actually looked as bad on their TVs as they do in some of the YouTube footage.